Remember last Christmas when I yelled at family? This year was stunned silence. Speechless awe. Yeah, Nick gets me. He knows what’s what. And this mixer is what, let me tell you! ‘Cause it has attachments, you see. And my talented husband knows how to work that roller. Sure, the filling tasted amazing. And balsamic brown butter sauce is epic. But paper thin pasta rolled to perfection just can’t be beaten. Or competed with, really. 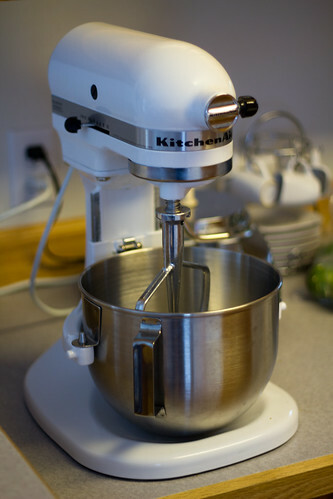 And making cookies with this mixer? No sweat. Literally! I don’t have to mix the chocolate chips in by hand anymore! You know how some people choose a certain car or shoe designer to fall head over heels for? For me, it’s this mixer. And I anticipate we’ll spend many happy years together. Glad you like the pasta roller attachment. I was wondering if you had used it yet. Looks like it works really well. It does! 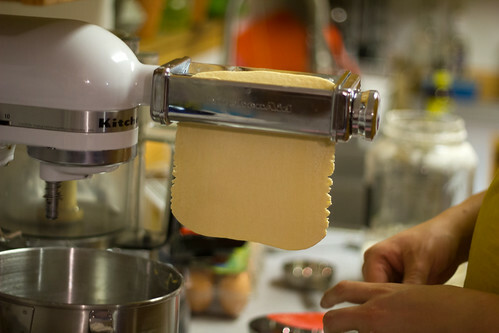 We’ve used it for raviolis a couple times and fettucini so far. I’m sooooo jealous!! I have been wanting one for a while now. But the one that I want is the expensive 6 quart one. Happy cooking/baking!